The African People’s Education and Defense Fund (APEDF) and Uhuru Furniture in Philadelphia sponsored our best ever-annual MLK Day on Monday, January 15, 2018. 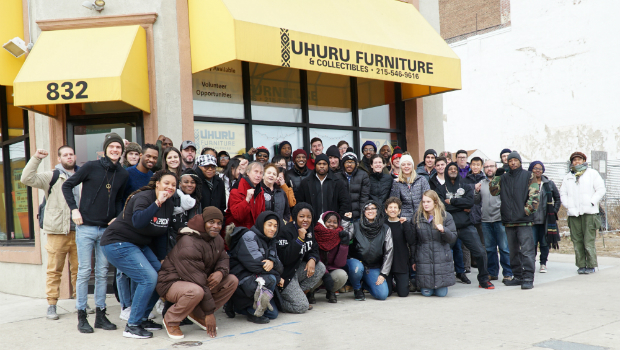 Uhuru Furniture was packed with African families, store customers, friends, volunteers, Uhuru Movement members and student groups who all came to support the MLK Day that carries on the struggle for African freedom. The program showed the history of the Civil Rights Movement in the ‘50s, the Black Power Movement in the ‘60s, and the Uhuru Movement for African self-determination today. We began with a powerful film on the history of the African liberation struggle, with clips of Martin Luther King, Malcolm X and Chairman Omali Yeshitela analyzing that history and the conditions today. African drummer Karen Smith and revolutionary poet and singer Rahnda Rize presented deeply moving culture, bringing us from the spirituals of the Underground Railroad to revolutionary African resistance today. Ticharwa Masimba, African People’s Socialist Party Economic Development Chair in St. Louis, MO, gave a dynamic presentation on the Black Power Blueprint, which is transforming abandoned buildings in St. Louis into institutions of African self-determination. This includes a new Uhuru House, a community marketplace, gardens, housing and economic development projects including the Uhuru Bakery Cafe, African Independence Workforce Program and Uhuru Foods and Pies. Participants gave powerful statements about why they chose to support this MLK Day and pledged to return. After the program, volunteers braved the subfreezing weather and distributed 4,260 door hangers promoting Uhuru Furniture, followed by lunch and prizes. Oakland MLK Day Service event 2018- thank you to everyone who participated! On Monday, January 15, 2018 in Oakland, CA, what once was considered a “Dream” was a reality as people gathered at the Uhuru House for an MLK Day of Activities to change the world. The APEDF and Black Star Industries (BSI) partnered to sponsor this day of volunteering. APEDF and BSI are serious about building an independent African economy and building African self-determination programs and institutions. Approximately 50 people participated to make the day a successful one. The day began with a welcome to volunteers and the significance of their participation. They were given a political overview of the Uhuru Movement through short presentations and video clips of work on the ground building towards our goals. Highlighted was the Black Power Blueprint work happening in St. Louis, MO. The rally served as inspiration for people who then divided into teams armed with thousands of door hangers promoting institutions of the Uhuru Movement. After hours in the field, people returned to share their experiences. The testimonials were powerful. Volunteers said that they chose to attend our MLK Day event because they wanted to do something and they wanted to take action. People said that they saw how they were giving people the opportunity to become part of a movement that was not just celebrating, but carrying on the legacy of Dr. Martin Luther King Jr.
APEDF and BSI are partnering again to build the 4th annual "Friends, Family and Freedom Uhuru Health Festival" that will be held Saturday, April 28 from 11 AM– until 4 PM at the beautiful Akwaaba Hall located at 7911 MacArthur Boulevard, Oakland, putting the power of health and healthcare back in the hands of the African community!